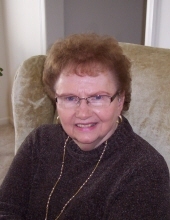 Jean B. Huffman, 86, of Rockingham, passed away Thursday, January 24, 2019, at Journeys Crossing in Elkton. Jean was born in White Sulfur Springs, WV, on December 25, 1932, a daughter of the late Ressie Pearl (Perkins) and Fred Lee Brown. She retired from JMU where she had worked as a secretary, and had attended Victory Fellowship Church in Dayton. On July 19, 1957, she was united in marriage to Robert Huffman, who survives. Jean is also survived by sons, Mark Huffman of Mechanicsville, and Chris Huffman of Rockingham; sister, Charlotte Vint of Gainesville; grandchildren, David, Aaron, Sarah, Dylan, and Blake Huffman. A funeral service will be conducted at 2 PM on Monday, January 28, 2019, at Johnson Funeral Service in Bridgewater, with Pastor W.L. "Sonny" Henkel officiating. Burial will follow at Dayton Cemetery. Memorial contributions may be made to the Alzheimer's Association, 1160 Pepsi Place, Suite 306, Charlottesville, VA 22901. To send flowers or a remembrance gift to the family of Jean B. Huffman, please visit our Tribute Store. Pastor W.L. "Sonny" Henkel officiating. Burial will follow the service. "Email Address" would like to share the life celebration of Jean B. Huffman. Click on the "link" to go to share a favorite memory or leave a condolence message for the family.